On Friday, I was on a quest to please Catholics. Jesuits, actually. One of the priests at work was hosting a party in his new residence, and I wanted to bring a cheese that would stand out against the woodwork, the much-talked-about window seats (where certain members of my department had fantasized about napping, reading Jane Eyre). I stood at the cheese counter, tapping my lip, until it occurred to me. Of course. I needed to bring a cheese with ash. Morbier has always been one of my favorite party cheeses because it's sparky, but it doesn't overpower a room with the smell of feet. It's the color of a well-worn pearl earring, and it has the suppleness of a fine handbag. People who are afraid of strong cheese generally like it, and the mohawk of ash down the center makes people lean over, squint, and dig in. It's a cheese with curiosity. I think the Brontes would have served it. I think Mr. Rochester would have kept some in his larder, enjoying a few nostril-flaring bites when he came in from the heath, fresh off his horse. There is something autumnal about Morbier -- think burning leaves, walnuts, orchard fruit. Steven Jenkins, in his wonderful Cheese Primer, calls it "the most seductive of all semisoft cheeses." He also compares the taste to veal sauteed in butter, which perhaps explains why it was such a hit with the Jesuits who attended the house-warming -- it's rumored that our Jesuits are fans of veal piccata. Here you can see them, happily noshing. I was delighted to have found a satisfying Jesuit-party cheese. Morbier has a rich history. In the foothills of the Jura Mountains, French cheesemakers used the ash to separate the morning milk from the evening milk. The ash kept the flies away and prevented the cheese from drying out. I was fascinated to read about this process because the makers of Humboldt Fog, an exquisite California cheese, perform this very ritual. Most Morbier that's available in the States is not created from morning and evening milk, and the dark line is made of vegetable ash, not the ash from the copper pot where the curds were cooked -- the traditional method. Still, Morbier is a pleaser. Read the label, and look for a Morbier that hales from Franche-Comte/Jura or Doubs origin. Then you have the real deal. 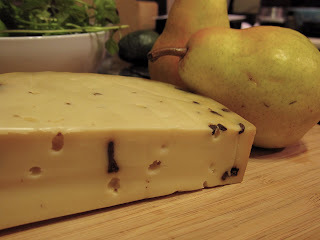 Melted Morbier is terrific, especially over boiled potatoes, Raclette-style, but it's also fine at room temp, shmeared on bread, served with a light, fruity red and a bowl of walnuts. Try inviting some theologians or some crusty professors. An excellent pairing. It's been a summer of revelatory pairings. Grilled okra rubbed with sesame oil is delicious, blue cheese goes well with fudge, vodka gimlets taste better on the beach. Now here's another quirky coupling that's cause for yawping at the stars: cumin-and-clove-spiced cheese. I'd never heard of the combination until the Wisconsin Milk Marketing Board sent me some samples, a freakin' flight of cumin-clove cheeses, no less. I've always been one for whimsy, but cloves in cheese? Really? Isn't that dangerously close to a sachet? Aren't we veering into Yankee Candle territory? I was a little afraid. A few weeks ago, I summoned the flotsam and jetsam of the cheese world (three articulate cheese lovers who appreciate irony and dairy) to a sampling party. They agreed to appear incognito; given the premise of the evening's tasting, they were hesitant to meet me unless I could guarantee total anonymity. Turns out, clove-cumin cheese is a Dutch tradition. It has a wonderful name, Nagelkaas, which translates into "nail cheese," a reference to the cloves, which are often left whole to resemble nails pounded into the wedge. Next time you're bumming in Amsterdam, you can impress -- um -- natives by asking for this specialty cheese, invented by the Frisian people of the northeast Netherlands. In the meantime, you can impress your friends with some domestic nagelkaas made in Wisconsin. A holiday nagelkaas party, anyone? It could be a Halloween hit if everyone wore hard hats. Better yet, save it for Thanksgiving or Christmas when you want to draw the relatives out of their Barcaloungers with a curious cheese flight. Hint: Set out some chutney and crusty bread. Then hours of gorging are possible. Stonewall Kitchen's Mango Chutney is a perfect match, as is some crisp Dutch beer. Feddost, Nordic Creamery: This American Cheese Society winner made from goat and cow milk had a lively flavor. The ground spices were well balanced, although the texture was slightly gummy and a bit grainy. One judge called it "the perfect Super Bowl snack cheese" and imagined it cubed, served alongside dark bread and thick soup. Cumin & Clove Organic Cheddar, Cedar Grove: This was the party favorite, a bold and creamy cheese with whole cumin seeds and "a tingle of clove," as one judge observed, adding, "It grabs you by the codpiece!" Marieka Gouda, Holland's Family Farms: Whole cloves and cumin seeds stand out in this raw milk cheese aged on pine planks. The texture is smooth, the flavor is rich and very clovey, making for a zingy, fascinating cheese. One judge suggested serving it with wassail or port after a brisk bout of caroling. This post is my humble bow to New York cheeses. Last weekend, Madame took a wee road trip to Binghamton to visit an old cheese companion who recently moved to the state. Being dairy dreamers, we found ourselves in the local Wegmans, groping the cold cases and befriending the monger, a delightful woman named Kim. Kim narrowed her eyes and fingered her smock. 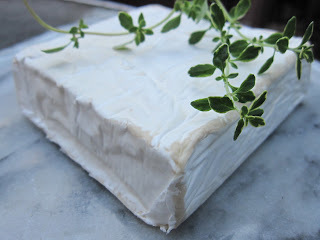 Under her breath, she mentioned something about a processed strawberry-flavored cheese, and when she saw our frozen grins, she walked us over to a dairy case and slipped me a square cheese wrapped in white paper: Hudson Valley Camembert. I nearly fainted. Camembert from New York? Imagine finding truffles growing in Detroit. I shrugged, dropped it into my basket, and trotted off in search of a crusty baguette. Friends, I had under-estimated the cheese makers of New York. I’d read about the state’s Farmstead & Artisan Cheese Guild, which includes fifty-some producers, but when I think of vacationing in cheese states, I spin the bottle toward Wisconsin, California, and Vermont. Now I’m ashamed. 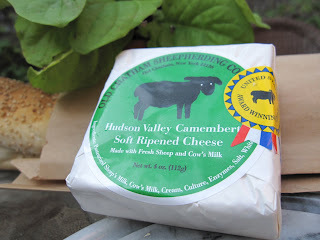 The Hudson Valley Camembert was lunatic good: grassy, buttery, peppery, and the rind had a beautiful bloom. The mouthfeel was exquisite, so satiny. It was like eating oysters. HV Camembert (think: Louis Vuitton Camembert) is made by Old Chatham Sheepherding Company, home to 1,000 East Friesian crossbred woolies. The Clarks, who run the farm, make their soft-ripened ‘bert using fresh milk from their own sheep, mixing it with their neighbor’s BGH-free cow’s milk. In 2001, this Camembert won “Best Cheese in America” at the U.S. Cheese Championship. Where was I? To make up for lost time, I will definitely be ordering some Old Chatham Ewe’s Blue and some Camembert Buttons – the gift baskets sold online are adorable. I’m also curious about the company’s ginger-flavored sheep’s milk yogurt. Looks like I may have to make a pilgrimage to Old Shaker Museum Road in Chatham, NY to meet the Clarks, and pay my respects. Real cheese hounds only serve cheese on bread so that flavors stay pure. Steven Jenkins, in The Cheese Primer (Workman, 1996), basically forbids crackers. Who knew? Every cheese book I read had something to say about plastic wrap. Most recommend special cheese paper, which is what pro cheese trafickers use; Saran strangles most cheese, which needs to breathe. If you do use Saran, for crying out loud always use a new piece. Buy slivers, not hunks. Cheese quality deteriorates the longer it sits around in your fridge. This is particularly true of fresh cheeses. Raw-milk cheese? Yep, it does taste better. Pasteurization kills some of the goodies in the milk and results in a less-complex cheese. “Vegetarian cheese” refers to cheeses that contain vegetable rennet rather than animal rennet, which comes from the stomach lining of an animal. Does it make a difference? 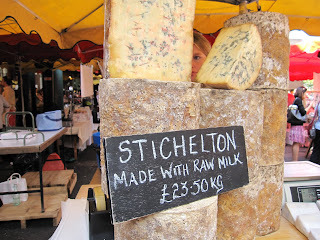 The Stichelton at Neal’s Yard Dairy in London uses animal rennet, while the imported Stichelton does not. Same cheese, different rennet. I have to say, the animal-rennet version tasted especially good, but maybe that was because I was eating it in bed, glass of wine in hand. There are 8 types of cheese: fresh, semi-soft, soft-ripened, surface-ripened, semi-hard, hard (aged), blue, and washed rind. The toffee-like crystals that form inside aged cheeses, like Prima Donna (an aged Gouda-style cheese), are made of lactic acid, not caramel-flavored Pop Rocks, despite my suspicions. Cheese tastes best at room temperature. When you have a bunch of cheese nubbins lying around, you can make a dip out of them, called “fromage fort.” The Cheese Primer forbids throwing away stray cheese and instructs: scrape off the mold, let the cheese soften, then whirr it in the food processor with lots of chopped garlic and some dry white wine. Whee! You’ve got dip. 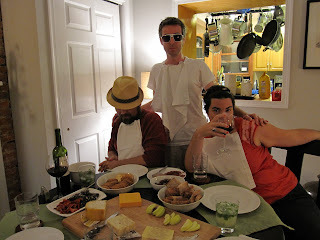 If you want to have some fun, host a blue-cheese party. For an interesting range, offer some Stichelton (raw-milk British Stilton), Bayley Hazen (a raw-milk cheese from Vermont), and Rogue River Smoky Blue (a great smoked blue from Oregon). Have your guests bring their local faves, and serve plenty of candied nuts, figs, and good port.